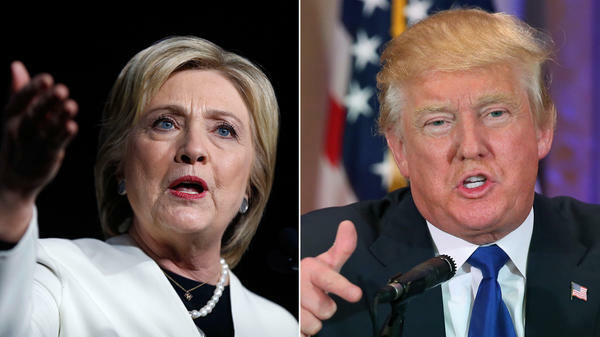 Hillary Clinton and Donald Trump both had big wins on Super Tuesday, taking multiple Southern states. 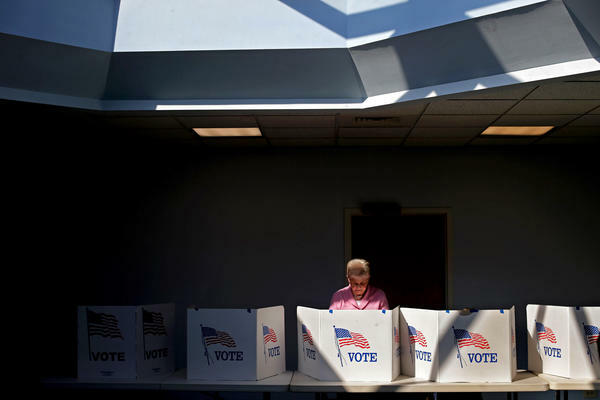 A voter casts her ballot at Fairfax Circle Baptist Church in Fairfax, Va.
Republican Presidential frontrunner Donald Trump speaks to the media at the Mar-A-Lago Club in Palm Beach, Fla.
Democratic presidential candidate Hillary Clinton addresses supporters at her Super Tuesday election night rally in Miami, Fla. In the Democratic race, Clinton also captured seven states: Georgia, Virginia, Texas, Alabama, Tennessee, Massachusetts and her onetime home of Arkansas. Sen. Bernie Sanders took his home state of Vermont and also picked up wins in Oklahoma's primary and the Colorado and Minnesota caucuses. After a week in which many top Republicans had promised to stop the real estate mogul, Trump rolled through the biggest primary night yet. But the boisterous billionaire was more subdued Tuesday night, trying to project a more presidential tone. 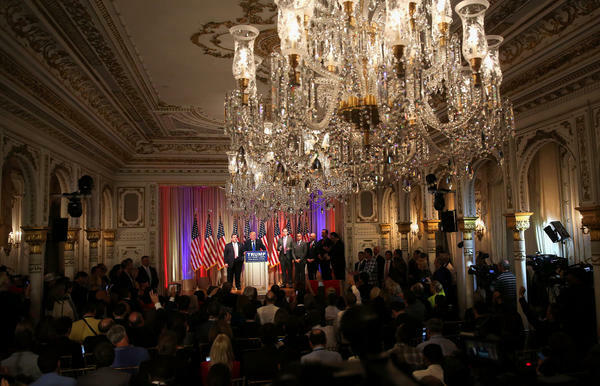 Instead of his usual rousing victory parties, he held a press conference at his Mar-a-Lago resort in Palm Beach, Fla.
"Tonight is the best of all," Trump declared, touting his resounding victories as they continued to pile up. He cast an eye toward the general election, promising he would bring the GOP together if he is the nominee and expand the party. "I'm a unifier," Trump said. "I know people are going to find that a little bit hard to believe, but believe me." He also jabbed at the "lightweight" Rubio for having a "tough night." The Florida senator had hit Trump hard this week but ended up with little to show for it; he finally won in Minnesota late on Tuesday. Rubio's next closest state was Virginia, where he did well in the D.C. suburbs, but Trump still pulled out a victory, robbing him of a major coup. Rubio had taken the stage earlier in Miami, exuding confidence nonetheless as the race moves to Florida in two weeks. "We are going to send the message loud and clear ... that the presidency of the United States will never be held by a con artist," Rubio declared, echoing a hit against Trump he has frequently used this week. But it was Cruz who used his wins in Texas and Oklahoma to frame the contest as a two-man race, calling for the other candidates to drop out. "So long as the field remains divided, Donald Trump's path to the nomination remains more likely, and that would be a disaster for Republicans, for conservatives and for the nation," Cruz said. "And after tonight, we have seen that our campaign is the only campaign that has beaten, that can beat and that will beat Donald Trump," he argued. Ohio Gov. John Kasich nearly pulled off an upset over Trump in Vermont, but would finish the night with no actual victories. His team is instead banking on a decisive victory in two weeks in his home state. "Tonight, I can say that we have absolutely exceeded expectations," he told a crowd in Mississippi. For Ben Carson, the results were even more bleak. His best showing of the evening was in Alabama, where he got 10 percent of the vote. But he, too, vowed to remain fighting. "Millions of Americans plead with me to continue," he told a crowd in Baltimore. "They know I am a citizen candidate, not a politician, who won't do what is expedient, but what is right." On the Democratic side, Clinton touted her strong finishes across the board, winning in states with diverse Democratic electorates. "All across our country today, Democrats voted to break down barriers so we can all rise together," she declared. Striking a noticeable contrast with Trump, her possible general election rival, she smiled as she said, "I believe what we need in America today is more love and kindness." 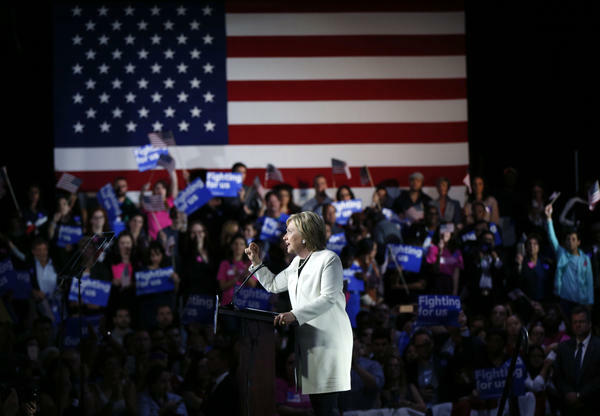 And she struck a populist tone, taking on one of Sanders' common themes as she told the crowd, "this country belongs to all of us, not just those at the top." Sanders came out shortly after 7:30 p.m. ET from his campaign party in Vermont for what was expected to be a long night. "By the end of tonight, we are going to win many hundreds of delegates," he told a roaring, adoring crowd in his home state. "The people who know me best have voted so strongly to put me in the White House," Sanders boasted, declaring that his campaign "is not just about electing a president; it is about transforming America."